no less an authority than Trina Robbins, America's foremost researcher into the female aspects of cartoon history, considers her the first. Robbins's declaration was made in her 1996 book, The Great Women Superheroes, which was published by Kitchen Sink Press (The Spirit, Li'l Abner). Of course, the point is debatable — Red (no relation, by the way) had no super powers, which some people consider a prerequisite for a superhero despite the fact that Batman, Green Arrow and a host of others generally considered part of that genre get along quite well without them. Also, Red was preceded in print by an entire month, by Fiction House's Fantomah, Mystery Woman of the Jungle. But while Fantomah met most criteria for a superhero, she didn't seem very much like one. Still, Red was out before Lady Luck, Invisible Scarlet O'Neill, Miss Fury and all the rest of the very early ones, and if one must pinpoint a first, she's an excellent choice. The Woman in Red first appeared in Thrilling Comics #2 (March, 1940), which was published by an outfit that went by several names over the years, including Standard, Nedor, Pines and Better. Its other female stars include Miss Masque and Jetta of the 21st Century. No publisher's logo appeared on the cover of that particular issue — nor did Red, in that issue or any other. The star of the early issues was Doc Strange (no relation); and while a female character (a Sheena knock-off named Princess Pantha) did eventually displace Doc, The Woman in Red was never so much as mentioned on a cover of Thrilling Comics. Her first story, as well as all the rest of the early ones, was written by Richard Hughes, who later edited the ACG line (Adventures into the Unknown, Herbie). The artist was George Mandel, not a major comic book talent, who also has scattered credits at Hillman Periodicals, Harvey Comics and a few other publishers, and who published a couple of books of single-panel cartoons. After World War II, Mandel turned to writing novels. Red's real name was Peggy Allen. She was a policewoman but, like The Blue Beetle, The Black Hood and several other costumed characters who were cops in everyday life, created a masked persona to get around those pesky legalities that hamper crime fighters who allow their true identities to be known. Other than the mask, her costume consisted mostly of a bright red, hooded, ankle-length cloak which (in contrast to most other female comic book heroes, especially the less anatomically plausible current ones) de-emphasized her sexual characteristics. In 1943, she spiffed herself up by adding a cape and showing a little leg, but the cover-all is how she started out. Tho the costume distanced her from her law-abiding colleagues, she did exercise the police officer's prerogative of packing heat. Her only foray outside of Thrilling Comics was in the first and second issues of America's Best Comics, an anthology title where the publisher got a little extra mileage out of its most popular characters. Along with Captain Future, The American Eagle and a few others, she actually did appear on the covers of those two issues, at least as a head shot in an inset. But since she wasn't exactly one of the company's "most popular", she was dropped from that comic once they managed to field a few more stars. She was also dropped from Thrilling Comics after just a few years. 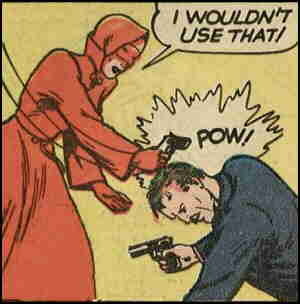 Her last appearance was in #46 (February, 1945), and she skipped several issues along the way. Since then, there have been a few unauthorized reprints, and not much else. In 2001, Alan Moore (Watchmen, Swamp Thing) featured her, along other superheroes from the Standard/Nedor/whatever line (such as Fighting Yank, The American Crusader (no relation), The Black Terror and quite a few others) in a pastiche in his Tom Strong series, published by DC Comics' Wildstorm imprint. Even there, she was a minor character. But she does have a strong claim to having been the very first female superhero. And with comic books today abounding in characters like The Black Canary, She-Hulk etc., that counts for a lot. Text ©2003-11 Donald D. Markstein. Art © Standard Comics.